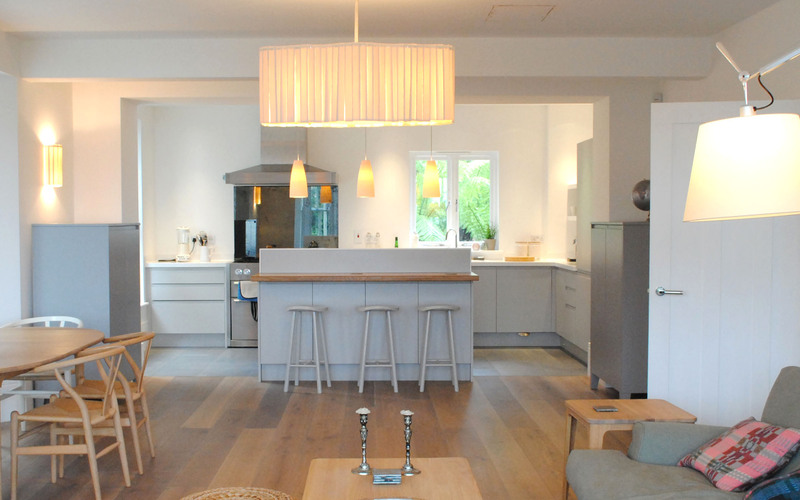 Planning the lighting for your new-build may seem daunting to self-build enthusiasts but with careful thought you can enjoy the benefits of a lighting layout that is not only atmospheric, but functional and energy-efficient as well. With the vast improvement in insulation materials over recent years the effect on our interior spaces has been quite dramatic. We are now able to lift our living areas into lofty heights without compromising on warmth whilst creating open plan, interconnecting living zones where the social functions of a modern-day family can be accommodated without the barriers of internal walls and doors. 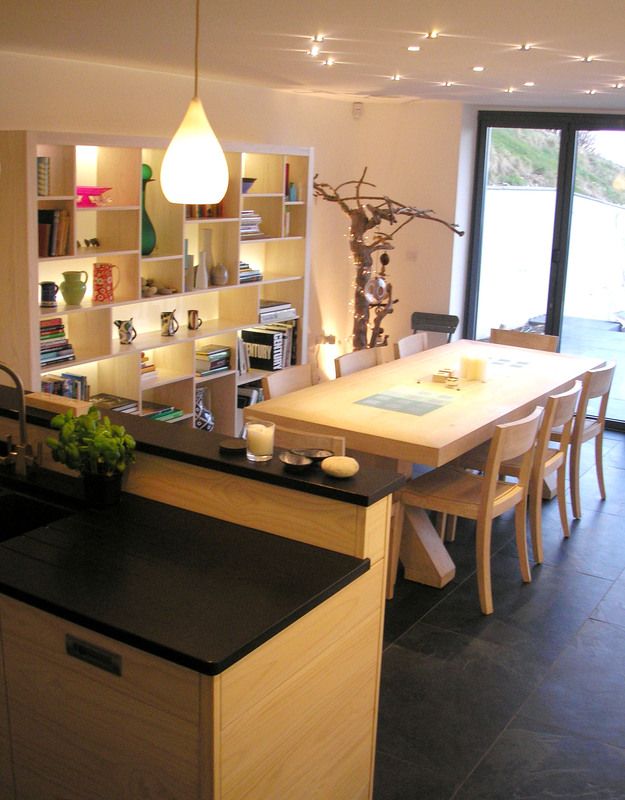 In order to achieve the best lighting effects the internal space needs to be planned; this is particularly important with kitchens and bathrooms but to achieve the best results, planning where the furniture will go in the open plan space will reap vast rewards. Seating may not always be near the walls, especially in large spaces, so deciding where the sofas and lounge chairs are going to be placed means that floor plugs can be situated in these locations either as standard plugs or part of a 5 amp circuit for lamps. It may be that a large rumbustious family area is not conducive to lamps in which case some downlights (with dark baffles for minimum glare) strategically placed over reading or games areas is more task focussed and when dimmed, can add to the atmosphere. It’s still worth factoring in the floor plugs though, even if they are not required initially, as the occupants’ needs may change over the years. 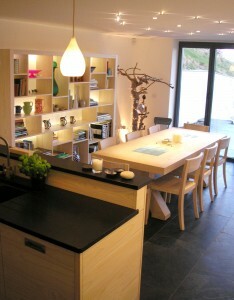 Deciding where the dining table is to be situated is often challenging but again it is worth making the decision as, in addition to selecting any feature lights, there will be dark nights when fish (with bones!) may be consumed – even if your own eyes are sharp and young at the moment, it is always worth future-proofing your lighting. 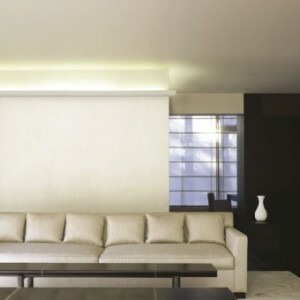 The secret of good lighting is to have layered light coming from various levels and it is here that the latest in LED technology can be brought into force with inground uplighters and floor washers adding interest as well as high vaulted ceilings being accentuated with spots or troughs housing LED casting light up onto the ceiling. Positioning and angling of linear LEDs is important – ideally you need enough space for the light to breathe and should aim to avoid any reflection of the individual LEDs within the tape. It is always worth noting that such lighting tends to show up any imperfections in the wall; this can be used to your advantage where the walls are purposefully textured but this is not always the case with supposedly smooth walls. There are several suppliers of plaster troughs and diffusers which are invaluable when planning indirect lighting; we often specify products from Orac Décor. From a design point of view, wide expanses of wall sometimes need breaking up and, if there are no relevant architectural features to highlight, it is here that the formation of niches or shelving – either to display objects or artwork – can incorporate lighting thereby serving a dual purpose. Similarly, light can be bounced off walls with the use of angled downlights or spots and this is where feature walls with artwork or textured walls can serve a dual purpose. Here we incorporated lighting behind opaque panels placed at the back of the shelves which added interest and also helped to widen the room. Planning the circuits will pull the design together and it is worth imagining various scenarios during this process and how they will interconnect. There will be times when, whilst the focus is in one living area, having the unused areas plunged into darkness would leave you feeling cold and vulnerable. Soft and subtle lighting in these regions gives a feeling of connection and, with the latest LEDs, can be executed whilst consuming minimal amounts of electricity. The more circuits that are incorporated in the lighting design the more flexible will be the living space and it is here that home automation can come into its own. If there is only one area in the house where home automation is used it is here that this facility is invaluable. Many owners will profess that it is ‘all too complicated’ but in fact the reverse is true. The software deals with the complicated bit – all you have to do is select the scene on the wall switch, phone or remote control to set a scene out of a pre-planned few. Much easier than twiddling dimmers or forgetting which switch relates to which circuit and it is a facility that is fast becoming a pre-requisite in contemporary new builds. With an open plan living space on the ground floor the stairs are often part of, if not a feature, of this area. Left in darkness this is another zone that can leave us feeling vulnerable and isolated and there are now numerous ways to accentuate beautiful stairways with low energy LEDs and feature lighting suspended from the floors above. Contemporary living spaces will often have large expanses of glass allowing natural light to flood in during the day but bear in mind the gloomy overcast days of our British winter when you will want to whack up the light in the core of the building. Good quality light output is required more on dull days than during the evening or night so factor in some crisp lighting to pep you up on those February mornings. When night does fall, ensure that some accent lighting has been incorporated beyond the plate glass windows as this will cheer the interior and will serve to soften the edges of your living space. Uplighting trees or plants with simple spike spots can still look dramatic and is a flexible solution to exterior lighting in the early stages of the building’s life; even path and step lights can add a magical element to the garden when viewed from the interior. Carefully planning your lighting in the early stages of the design will ensure that your space is flexible and functional and you will reap the benefits in the years to come. And bear in mind the pace at which things change in the building world – unless we plan for tomorrow we are already planning for yesterday. We design and specify lighting schemes throughout the UK and beyond. All projects can be carried out remotely and are fully transparent enabling our clients to purchase light fittings direct from suppliers at the best prices.